This work is based on an in-situ drawing of Self Portrait (1861) by Dante Gabriel Rossetti at Birmingham Museum and Art Gallery. Revisiting my in-situ observation study of Self Portrait by Rossetti I used silver ink to record my initial observation. 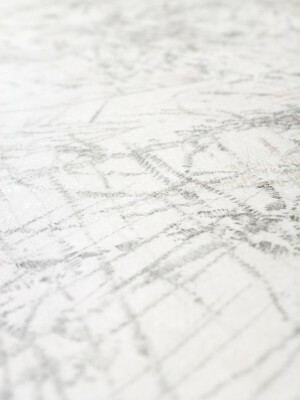 Using graphite, new layers of drawing activity were repeated over the first layer of silver marks. 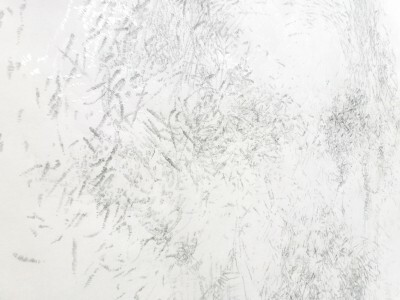 The repeated layers of drawing aim to record each time a small area of the in-situ observation drawing has been observed, building up a dense overview of my observation activity. 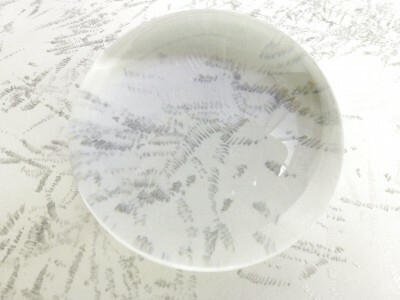 A glass magnifying lens rests on the horizontal paper surface. 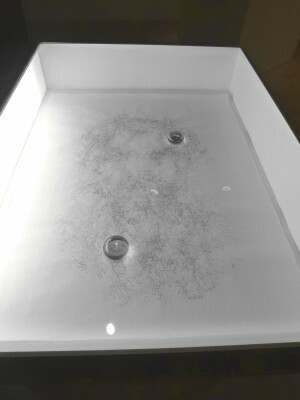 In a low lit room Encounter 4 is installed in an internally lit shallow cabinet (110 x 90 x 20cm) with a clear acrylic top. 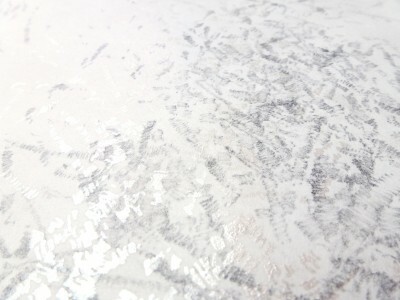 The reflective silver marks appear to change with the light and the movement of the viewer. 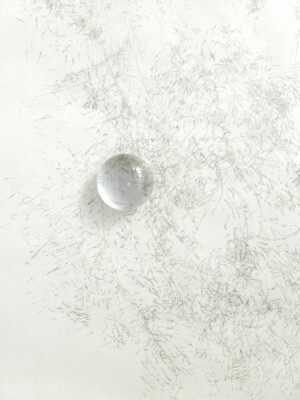 The glass lens laid on the paper refers to visual focus and also encourages the viewer to engage more closely with the work, repeating my own engagement with the original drawing. This piece is displayed with Encounter 5 (animation) and Encounter 3 (drawing). 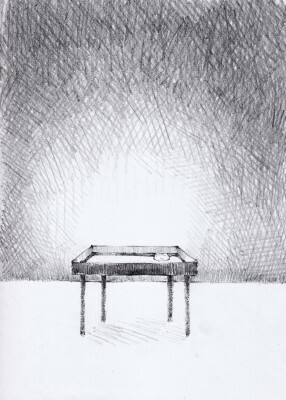 As a whole this installation aims to make connections to observing drawing as a series of marks (Encounter 3), observing drawing as representation (Encounter 4), and through animation, the experience of drawing traces of past drawing activity in a museum context (Encounter 5). 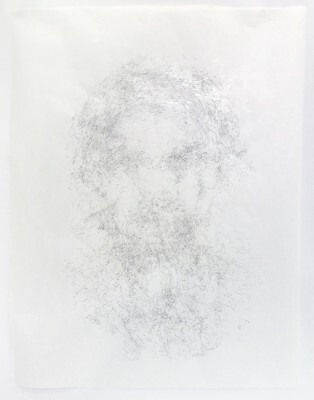 The process of drawing and memory is investigated through layers of marks which trace and retrace detail within the initial in-situ drawing of the Rossetti Self Portrait at Birmingham Museum and Art Gallery. Semiotic theories, as described by the philosopher and scientist Peirce, suggest the eye strains between, on the one hand recognising a drawing as a representative image, and on the other as a series of marks (Chandler, 2011). My aim in Encounter 4 is exploration of my original drawings as an account balanced in favour of its condition as a representation. 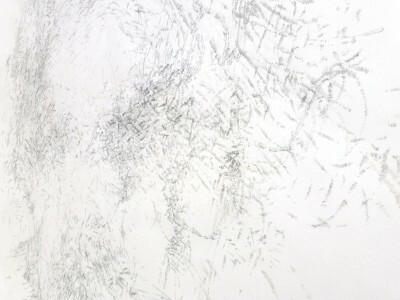 This contrasts with Encounter 1, 2, and 3 which explore drawing as a series of marks. Across the wider Encounter series I have attempted to understand drawing both as a specific series of marks, and also in terms of its condition as a representation.